I come into Southern Soul a bit later than usual to spend a couple hours finishing up and saying my goodbyes before we leave St Simons Island. I say goodbye to Terrance at the Pit, I will miss him. He makes cooking BBQ easy, and as those who love to cook BBQ know, it’s many things, but easy is not one of them. I spot Griffin, Harrison’s business partner and co-founder of Southern Soul. I want to make sure he gets his T-shirt and I thank him for his hospitality as well. Though I’ve spent more of my time with Harrison in the restaurant, the guys in the kitchen talk to me about Griffin and they believe his networking and marketing genius have been integral to the success of the restaurant. I’ve seen him as he pops into the kitchen sporadically to make dishes like tomato pie and then he disappears again. I’m intrigued by Griffin’s work as I’ve come to understand how essential this side of the business is, and an element I’ve neglected since starting Red Gum, until recently. For the last 6 months I have made this a focus of my time and have seen the rewards. Melissa, my wife arrives to take some pictures of me, Harrison, Kitty and Griffin in front of the pits. We’ll use these for marketing purposes but also, I just really want to capture the moment as I have had such a great time. I am planning a Southern Lovin BBQ dinner that I will be putting on when I get back from my US trip. This will have my favourite dishes that I made and ate during my time at Southern Soul and across the South; I have Jason on speed dial just in case I forget something. This will be a ticketed event so stay tuned. After photos I head inside into the kitchen to grab some pics with the crew. 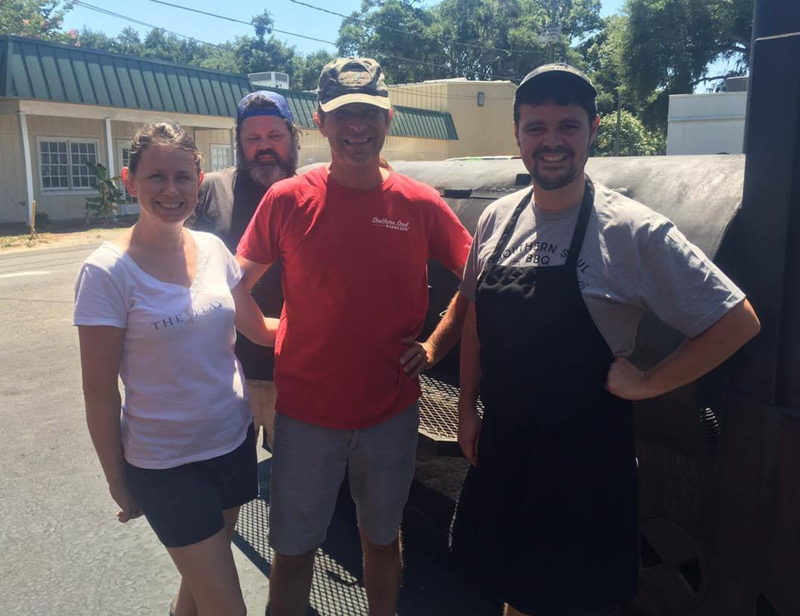 They have taught me a lot, not only about BBQ and Southern Cooking but also about their lives in America, their personal insights into the culture and the politics and their experiences of this part of the world and for that I thank them. I’m leaving a little bit wiser and a little bit wider. Far out - I have eaten a lot! I would personally like to thank Harrison, Kitty and Griffin for their Hospitality. At the start of this year I sent an email to Harrison asking if I come and hang out for a week and work in his restaurant, I am so glad I did and that he agreed! He has been so welcoming and willing to share experiences and knowledge. The dude loves to laugh and have fun and you can see that this rubs off on his employees and the experience customers have at Southern Soul. His BBQ is exceptional, the pulled pork is the best I have ever had and his St Louis spares are delicious. I am more determined then ever to try and source quality pork ribs to add to my menu as they are so good. I’m hoping he takes me up on my offer to return the hospitality and visit us in Oz. We’d all be lucky to have him cook for us! Before I go Harrison sends a text to Bryan the owner of B’s Cracklin’ BBQ in Savannah Georgia letting him know we are going to visit him. Bryan is famous for his whole hog and I am excited to be going to Savannah and to B’s. From St Simon’s Island we to Savannah, a place that holds a special place in my heart. My wife and I visited here years ago, before children. It’s where she spent much time as a child with her grandparents and her love of it and the charm of the place, rubs off on me. It’s a quintessential southern city, with a rich history, beautiful homes, a downtown built around small garden squares and gas lanterns lighting the streets at night. When we arrive we decide visit Paula Deen’s Restaurant. If you don’t know who she is, she is the Queen of Southern Cooking, google her. I get the Chicken Pot Pie and it’s great. Melissa get’s the Southern buffet, fried chicken, ribs and an assortment of southern sides. It also comes with dessert, she opts for, surprise! The Banana pudding. This is the second day in a row I have had banana pudding. Still love it. We stay at the Brice, it is beautiful boutique hotel (we seem to find ourselves at one fancy joint per trip, it has become a bit of tradition). We first started doing this when we lived in the UK together as poor students. We visited Austria around 12 years ago and we stayed in the nicest hotel in town for one night. Posh hotel sheets are the best. After a good night sleep we decide to go for lunch at B’s. It is only about 10mins from Melissa’s grandparents old home so we decide to swing past there first. It was amazing to see the house that Melissa has spoken so fondly off. Next stop B’s. We pull up to the middle shop in a strip mall, I can already smell the BBQ. We walk in and I recognise Bryan instantly, he’s quite the recognisable cat - tall with long dreads. It also helps that he’s wearing a baseball cap that says owner. He is expecting us and he introduces us to his wife Nikki who is lovely. From what I have noticed of Southern BBQ joints is that they are run by husband and wife teams, Melissa and I seem to be continuing this tradition! I am lucky to catch him as he is off to a meeting this afternoon. Exciting things are happening at B’s and it just inspires me to continue doing what I am doing. I ask if we can go see his Pit. It appears that Georgia is Lang country. Bryan has a monster reverse flow offset out the back of his joint. We head back into the restaurant, exchange t-shirts and he heads into the kitchen to rustle us up a platter, we have St Louis spares, chopped hog, pork sausage, half bird, brisket and sides. I really like his hash, which is like a savoury pork stew over rice. We also got, you guessed it, Banana Pudding! This is now day 3. I must admit Brian’s BBQ is excellent and his Georgia peach mustard sauce is unreal. Grandma's pool on Amelia Island, Florida. Back to holiday'ing! We leave Georgia to head back to Amelia Island and spend more time with family. But I leave with a big smile on my face - the kindness and openness of folk I have met and worked with over here is so uplifting. I’m done blogging for the time being. It’s been an awesome way to document my time and to share it with our BBQ friends and family across the world. I am looking forward to the last week or so of our trip – more time with friends and family, heading south, enjoying summer and more time thinking about how to interject some of this Southern magic into Red Gum BBQ. And on a last note… we’ve got news brewing… looking forward to sharing this with you all, LIVE, soon, on facebook. Keep listening. Peace and Pork to you all!